Splice and patch box, mounting depth 225 mm, continuously depth-adjustable up to 55 mm; rear cable feed, cable entry possible from three different angles. 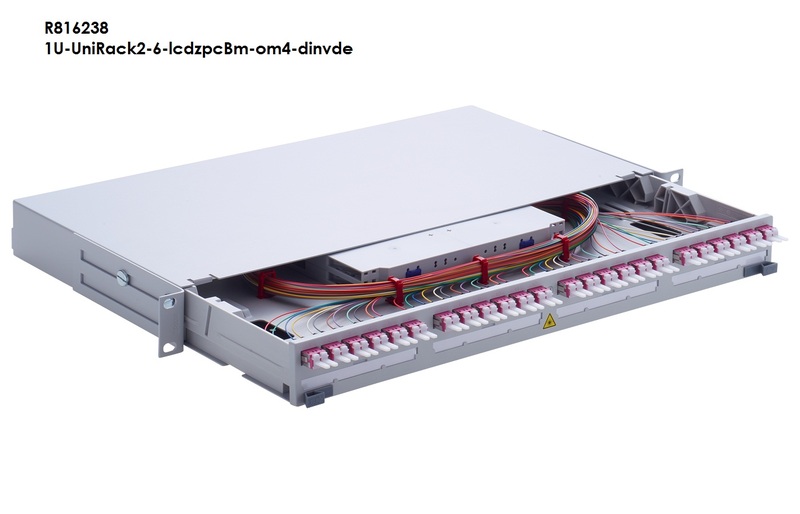 The box has two levels, the lower level serves as storage for spare loose tubes, tray fixation in the side structure is ensured; the upper level serves as storage for spare pigtails (1.3 m of fiber stored in the splice tray). Guaranteed bending radius ≥ 40 mm, fitted ready for splicing with pigtails and adapters, inserted and tested, two or less splice trays with radius 40 mm, box continuously extendable up to 210 mm, at full extension it can be inclined 10° forwards. Optimum access to loose tubes, adapters and pigtails, the tray can be fully detached from the box by release lever. Includes indelible laser trademark, fastening material, labeling strips and installation instructions. Fitted with 12 x LC-Duplex multimode adapter in acc. with IEC 61754-20. Flangeless body and integrated quick-mounting clip, color metallic, material X10CrNi18-8 for screwless mounting. Housing heather violet (multimode PC), material PBT / UL 94 V-0, zirconia (ceramic) alignment sleeve, integral self-closing metal laser protection flaps, semi-transparent plastic dust covers, allowing optical testing with test lasers without removing the covers. The adapter qualified in acc. with IEC 61753-1 for category U (uncontrolled environment). and 24 x pigtails with semi-tight buffer PA/PBT, Ø 0.9 mm, color in acc. with color code DIN/VDE 0888, multimode G50 50/125 µm (OM4), length 2.5 m. Fitted with one LC connector in acc. with IEC 61754-20. Zirconia (ceramic) ferrule with a PC polished endface geometry, connector qualified in acc. with IEC 61753-1 for category U (uncontrolled environment). Beige connector housing (multimode), material PC / UL 94 V-0, black strain relief and white plastic dust cover.